In the high end, tweaks do not always enjoy a high reputation. The term itself suggests a mere fiddling with the sound rather than a substantial improvement. Add to that a proliferation of products, not a few of which carry the tag “magic” or the like, and you can quickly end up a jaded audiophile. I know. Years ago, I was headed down that path. As an audio newbie, I was fascinated by just about every product that promised a potent change for the better to my Snell E/IV loudspeakers and Conrad-Johnson gear. Sometimes I heard one; other times I may have convinced myself, at least briefly, that the sound had improved. But eventually, I grew tired of the whole rigamarole—the time and effort devoted to discerning changes to the sound. There matters rested for years. Then I started hearing subterranean rumbles about a company called Stillpoints that was manufacturing isolation devices that supposedly had a transformative effect on audio systems. I was skeptical. My skepticism remained largely undiminished after I talked to the company’s Bruce Jacobs—or, to put it more precisely, he expounded upon the company’s approach to isolation, for Jacobs is a veritable gusher of information about all things audio—who promised to send out some of the company’s premier Ultra 5 isolation feet to situate under my Wilson XLF loudspeakers. 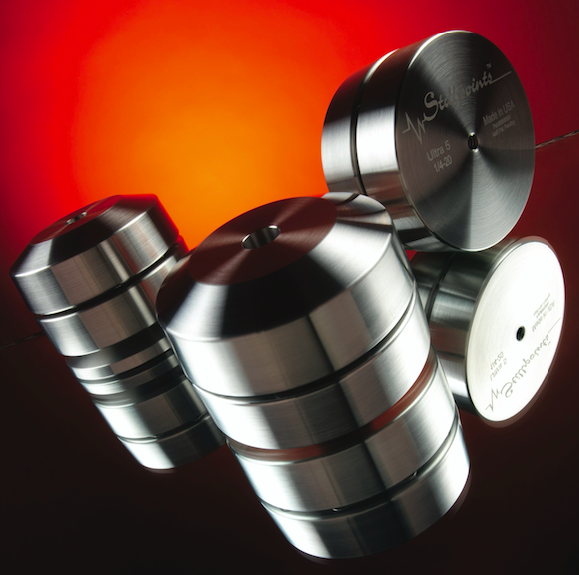 They are fashioned out of stainless steel and rely on minute ceramic bearings to dissipate micro-vibrations. The devices are clearly complex in design and build, but I chalked up some of Jacobs’ ebullience for the product to rote salesman talk. How much, I couldn’t help wondering, could the sound really change? To say that the sound changed would be a misnomer. After replacing the stock Wilson spikes with the Ultra 5s, I felt something like P.G. Wodehouse’s Bertie Wooster after he’s been on a bender and the next morning consumes one of Jeeves’ special pick-me-ups laced with Tabasco sauce. Sonically things started exploding. It didn’t require any effort to hear that the sound had indeed been dramatically altered for the better. Start with midbass punch. One of my favorite cuts, introduced to me by A.J. Conti during a visit to his factory in New Hampshire, is “Gypsy Woman” on the album We Came to Play by the a cappella group the Persuasions. I could immediately hear the benefits of the superior isolation of the Ultra 5 feet—the midbass vocals sounded as if they had suddenly been filled in. Imaging was far more precise. The treble was smoother and silkier. Given the salubrious effects that simply replacing the Wilson spikes created, I was now really eager to hear the Stillpoints under the rest of my equipment. I installed the company’s new Ultra 6 feet with custom bases beneath my front-end gear. (I recommend using the Stillpoints special Ultra Base with the Ultra 6. It makes a big difference.) The Ultra 6 is the first Stillpoints product to employ opposing technology pockets on the isolator. Let me say upfront that I don’t think the changes with the Ultra 6 were quite as dramatic as those of the Ultra 5s were underneath my loudspeakers. But I can assure you that the improvements with the Ultra 6 were real and tangible. In Issue 218, TAS editor Robert Harley cogently described the phenomenon called “transient blurring.” And it is here, brothers and sisters, that the Ultra 6 isolation devices truly excel. Each time I inserted the Ultra 6s I discerned a settling effect, like a placid ocean after a storm. The loudspeakers seemed to disappear a little more; instruments became more palpable and detached from each other; and the bass was more powerful and richer. And the blackness of the backgrounds. Oh, my! Any vestigial noise, any electronic effluvia, any intrusion, in short, on the sound seemed to be audibly lowered. Whether it was solo piano or voice or orchestra, the music came across as less mechanical and more fluid. What the Stillpoints do for piano, for example, is nothing short of remarkable. On András Schiff’s London recording of J.S. Bach’s French Suites, I was bowled over by the richness and clarity of the piano. The left-hand lines, which can often become blurred or murky, emerged with a sense of energy and drive, of dynamism and precision, that I had never previously heard. In fact, I had always found the CD to sound a touch brittle. Add the Stillpoints and the fluidity I mentioned above replaces any astringency that may have existed before. A sense of dynamic heft is greatly enhanced as well. The transient attack on piano is more focused and rings with newfound authority. This allows piano lines to sing with a freedom that they had not hitherto possessed. At the same time, the Stillpoints allow pianissimo passages to emerge with greater lucidity. On an EMI LP collection of Elly Ameling singing Erik Satie’s “Je te veux,” it was mesmerizing to hear the tiniest quavers in her voice. Then there is jazz drummer Albert “Tootie” Heath’s new CD Philadelphia Beat. On the venerable cut “Bags’ Groove,” his finger cymbals resound with uncanny accuracy deep in the soundstage, with gobs of air surrounding them. Put simply, the Stillpoints will allow you to hear a lot deeper into your recordings, extracting tiny details that were previously obscured or even effaced by a scrim of noise. Often it’s easy to get enamored of a change in the sound of your stereo system, then become less persuaded after extended listening. Been there, done that, as the saying goes. But not in this case. On the contrary, my enthusiasm for this product has never wavered one iota. After listening to the Stillpoints isolation feet for over a year, I have come to consider them an indispensable part of my system. None of the downsides that I’ve heard with many isolation products, such as ringing in the treble or a more sterile presentation, seem to apply to these amazing devices. When it comes to Stillpoints, I can’t keep still about their virtues.